Yesterday the United Nations General Assembly voted 176 to 7 to grant statehood to Palestine in response to the United States' decision to recognize Jerusalem as Israel's capital. 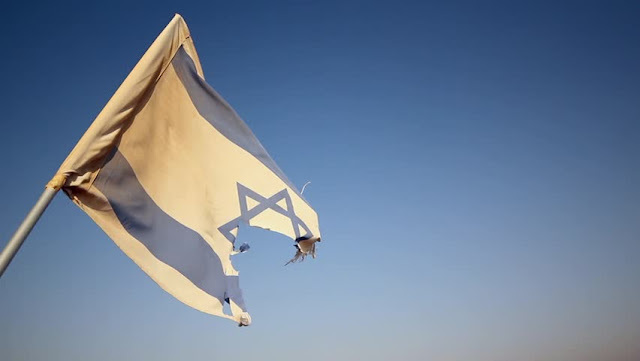 Only a successful Security Council vote can actually grant statehood to Palestine, but the General Assembly vote is yet another slap in the face to Israel and a denial of the biblical mandate in which God granted the land to the Jewish people. On Thursday, Arab states are introducing a U.S.-vetoed resolution from the Security Council into the General Assembly. The document denies that Jerusalem is the capital of Israel. Recognizing the likelihood that this anti-Semitic and anti-Zionist resolution will pass overwhelmingly, the Trump Administration is warning member states not to back the measure. Trump officials are circulating a notice and warning countries that backing the measure may result in loss of financial aid from the U.S. The Palestinian Authority itself is launching a full-scale diplomatic attack on the U.S. and Israel. Abbas has now stated quite emphatically that the U.S. government will no longer be involved in the peace process. He has also announced that the Palestinians will now be joining some 500 international organizations at a rate of over 20 a week. I'm reminded that all of this is coming to a head just a few days short of the one year anniversary of Security Council Resolution 2334, which condemned Israel for its presence in Judea and Samaria and effectively sought to divide God's land. The resolution passed on December 23, 2016 when then President Obama ordered U.S. ambassador Samantha Power to abstain from the vote. WARNING: World leaders are increasingly backing themselves into a corner vis-à-vis God with these votes. Truly it can be said that the world has collectively come against the Jews and their God-given land and have sought to divide it and to move the boundary stones of Jerusalem. God is well within His rights to bring judgment. 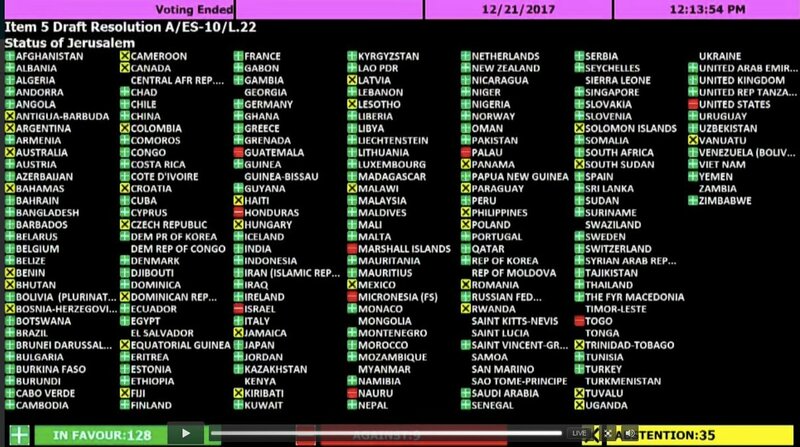 UPDATE (Thursday, December 21): The United Nations General Assembly has just voted 128 to 9 to condemn the U.S. decision on Jerusalem. The media is billing this as an overwhelming world rebuke of the United States, but these anti-Israel resolutions are typically won with 170 or more votes. It appears the Trump/Haley tactic has worked to expose those who are softer and more negotiable on Israel. There were 35 abstentions. Israel now knows who to target with diplomatic efforts. Whew! Things are moving at an ever-increasing pace. Look up! Our redemption is drawing nigh. Very happy the US continues to stand behind Israel. Mahershalalhashbaz - Hebrew name meaning "swift are the spoils, speedy is the plunder" Maher-shalal-hash-baz, was the second son of the prophet Isaiah. This is the longest name (and word) used in the Bible. Love it Kellie... Maranatha Everyone... see ya soon! The stage for Zechariah Chapter 12 is rapidly being set. 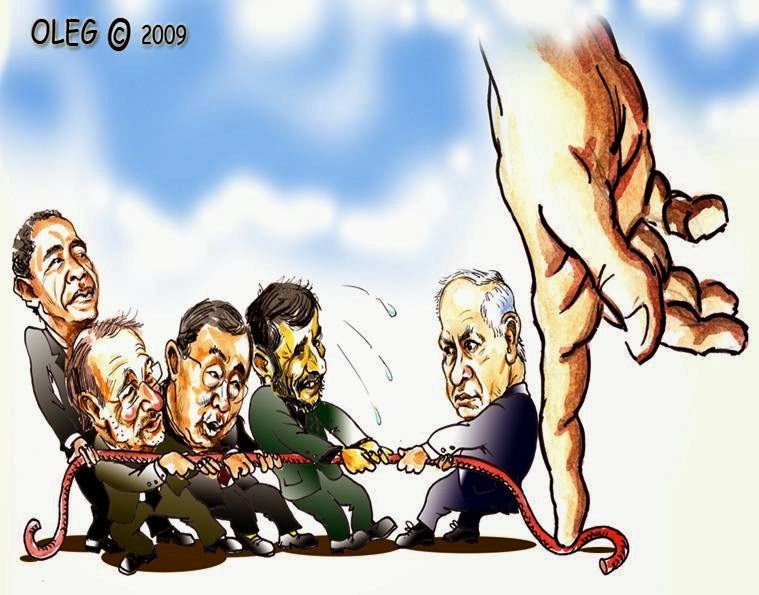 Truly, God will deal with all Israel's enemies. He put down 30 kings as the children of Israel made their way to the Promised Land. The U.N., Europe, China, Russia, Iran, Syria etc are no problem for the Lord. *sigh* 😑🙄🙄🙄 relax church just relax. LOL unknown!! We all need that sometimes. Goodness, I don't recall many if any times that hysteria has ever ruled unsealed.org. Plenty of excitement to go around my friend, but no hysteria...a bit of joy and anticipation will do you wonders. Unlnown's comments here have never been meant to edify or uplift. She must be a real killjoy at parties. Similar to anonymous or "Unknown" comments in real life, I don't even read anything marked "Unknown" on unsealed...or if I do, I assume the opposite is true...but it's just best to ignore "Unknown"
Sage advice, Steve. No use for the lukewarm. @Archangel yes let's spew this unknown lukrwarm substance out of our mouths! Gees, Unknown it seems that what you have written above applies to yourself. Unknown, you should take your own advice. You sure think highly of yourself. Tell a waiting bride to calm down, you probably get a face-full of bouquet. Not sure what else you expected around here, given the constant attempts of others (who by the way write under names like unknown and anonymous) to be wholesale wet blankets, troublemakers and ne’er-do-wells. That being said, dearly beloved, put on more tender mercies. Neither side of you should be name-calling. We are not each other’s enemy. Let those who love his appearing understand that to some we seem a little preoccupied to others, and those who have gifts study to build up the body. Keep up the faithful truth in reporting! Your posts never disappoint. Watchers don't resort to hysteria; they love His appearing! Maranatha! Ahmein Betrothed2Him!!! I 💯% agree! Not hysteria....just Thrilled, Excited with anticipation because our redemption draws ever so close!! Yes Jesus come quickly!!! We want to come home . Who can win when they challenge God? No one can. What would Jesus do ? Would he rebuke someone for an opinion? Or would he consider what the true meaning was in the comment? God bless all and praise Jesus. He is always the answer. The only other thing would say regarding the talk we are having is. When your doing something well there is no reason to talk it up. Remember don't let the left hand know what the right hand is doing. God knows all there are no secrets. Let's all be pleasing to the lord in all we do. Merry Christmas to all and again God bless you all! Jesus the Prince of Peace was ferocious about protecting peace and rebuked those who try to see attention and cause division. We must be too. When He said "It's not here" My head hung in shame! I have also noticed the demeanor in the site . I am not sure the host reads all the comments but if he dies and doesn't say anything that brings in the sin of pride. Let them pile the hot coals on they're own heads. I agree stop forecasting and do what the Lord Jesus has said to do. I struggle myself with many sins daily. These people are good hearted and will someday see they're. Amen to all that is said within this poem. God's judgement on ISUSrael is coming , and it will be swift. that you gave me to do. mine, and I am glorified in them." of its own and the light shines in darkness. as true children of the One true King. desire is LOVE and His name is Jesus. Christmas is usually a tough time of year for me and to those who are also dealing with difficulty for the Lord, grace and peace to you in Jesus' name. Blessed Christmas beloved ones. Steve, I understand difficulty at this time of year. This is my first Christmas without my beloved mother. Like God's Holy Word says, weeping endures for the night but joy comes in the morning. I give God all the honor, praise, glory and credit for helping me everyday and binding up my wounds. He will do the same for you because He is a good God. May God bless you and your family and Merry Christmas.